Last night as it snowed up a storm outside Chris Ayer put on an excellent show for 45 people, and he was accompanied by Jim Pearson on keys and guitar on several songs. At 25 years old, Chris sings beautifully, writes interesting, smart songs and has a bright future in the singer-songwriter trade. Check him out! Due to anticipated demand, this show is being held in a larger venue, Halfabubbleoff Studios. See below for more info. Chris Ayer's clever lyrics and song structure are driving a powerful career path for this 25 year old singer/songwriter. 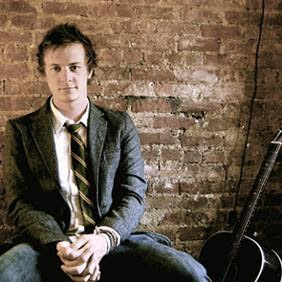 Chris tours nationally and won the Grand Prize in the 2006 John Lennon Songwriting Competition Folk category for "Evaporate". In November 2006 the song was also recognized by VH-1, winning Song Of The Month in their Save The Music competition (Adult Contemporary Category). Chris was also Performing Songwriter Magazine's "Do It Yourself" pick for March 2007. His latest album, This Is The Place, was recorded in Nashville and produced by Jason Gantt (The Chieftains, Brooks & Dunn, Tim McGraw, Faith Hill). Chris's next studio album is set for release in spring 2008. "Part street poet, part armchair philosopher, indie singer/songwriter Chris Ayer will leave you smiling whether you feel like smiling or not. You gotta love this guy... This Is The Place is a delightful discovery." "Ayer's effort has it all- tight arrangements, excellent musicality and imaginative lyrics. If you're looking for great music, this is the place indeed." Potluck Dinner/Reception 5 - 7 p.m.
Donation is $15 advance, $20 day of show. Reservations are suggested. To reserve your seat(s), please make checks payable to Chris Ayer, and mail to: Donna Pearson, 181 Hart Bench Road, Darby, MT 59829. Michael and I are really looking forward to hearing Chris in concert. I know it will be a great evening for all. The Concert that Chris put on was fantastic! We thoroughly enjoyed his singing. hope to see him back here in the Rockies soon.